SPORTSWOMAN OF THE YEAR MONTHLY AWARD – JANUARY, 2010: AFTER THE agony they endured this week waiting for the ruling of the Court of Arbitration for Sport (CAS), Aoife Hoey and Claire Bergin might have regarded the prospect of taking on one of the fastest bobsleigh tracks in history as an entirely stress-free exercise. For Hoey, the threat posed to her place in the Winter Olympics by the Australian challenge was especially upsetting having narrowly missed out on qualifying for the past two Games with her sister Siobhán, now the Irish chef de mission in Vancouver. After last night’s decision, that is now, thankfully, behind them. With Bergin, though, Hoey made it third time lucky when the pair’s top-20 finish in San Moritz last month sealed their qualification for the Games, the first time Ireland had earned a place in the women’s Olympic bobsleigh event. While Bergin (25), an accountancy student from Dublin who is on a training contract with Deloitte, only took up the sport in 2008, Hoey, a 26-year-old from Portarlington, followed her sister in to bobsleighing a decade ago. Both are steeped in athletics: Hoey is a former national triple jump champion and Bergin a former champion junior sprinter who competed in the European Indoor Championships last year. 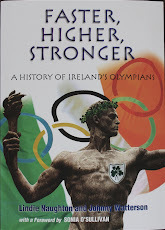 After Siobhán Hoey retired from the sport, Aoife persuaded Bergin and another athlete, Leona Byrne, to give it a try, and once they conquered their initial (and reasonable) fear they became an integral part of Hoey’s push for a place in the 2010 Games. Byrne is now the alternate to Bergin, the crew’s brakeman, with Hoey the pilot. It was a difficult road, but the progress has been hugely impressive. Hoey and Bergin finished in the top-10 at the World Junior Championships last season, before Byrne teamed up with Hoey to just miss out on medals at European Cup races in Switzerland and Italy. On the road to Vancouver, Hoey and Bergin, up against 16 crews from more traditional winter sport-powers, came seventh in the first round of the European Cup, securing another top-10 finish in the second round. Since November, the pair, sensing they could be Canada- bound if they maintained that progress, devoted all their time to their sport, Hoey taking a break from her job as a development officer with Athletics Ireland. Inch by inch they moved towards clinching qualification; their results in a World Cup event in Germany in early January were followed by that 20th place in St Moritz which sealed it. With the right support – and equipment – Aoife Hoey believes 2010 can be the kickstart for greater things, both for her and her team-mates and others coming in to the sport in Ireland. Hoey and Bergin, then, might have made history, but they are fully focused on the future.